I bet I can guess something about you. As a reader, first lines are important to you. In both literature and theater, we view first words as the opening gates into another world. 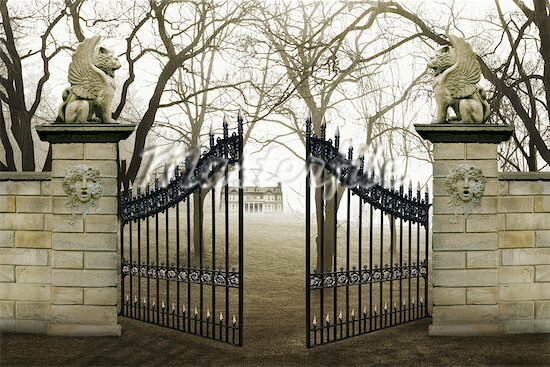 As lovers of literature we yearn to cross the threshold beyond gates, and eagerly do so if the gates look inviting enough. Though we are warned this is a sad story, we are drawn into Márquez’s world by his sublime gift of storytelling. We understand and accept his challenge to our emotions because of the power of his words. I don’t know about you, but I have to know where Beckett is going with this. Ten words, just ten words, yet they beg many questions. Is this world so depressing that even the sun is melancholy? Or, is the sun trapped by fate; having no say it what it does? It shines because it has to, there is no other choice. And what is this place of “nothing new”? Perhaps this world is locked in a cycle of sameness, with little or no hope to escape the boredom and fatigue that these words hint at. Brave readers will have no problem entering this world. There is something oddly seductive yet sinister about this first line. As I sat and contemplated them, a vision came to mind: I saw an rundown, dusty carnival tent flap being held open by a grinning man wearing black, promising wondrous sights and sensations. Or, will it be nightmares and horrors? In case you haven’t guessed, this is from Shakespeare’s Romeo and Juliet. Here audiences are being warned that this will be a tragedy. These words ready us enter a world in which old wounds, not quite healed, will open up to rip anew. Oh, there will be blood! As the play unfolds and battle lines are drawn, we the audience, try in vain to figure out who to side with. Do we offer our loyalties and sympathies to the proud and rash Montagues,or do we side with the noble yet oddly blind Capulets? Which is right? Shakespeare knows all too well that his audience will struggle with this question. He, after all, is the master of human nature. That we will pick a side is an issue he deals with from the very start of the play. Shakespeare warns us not to do this in the first six opening words: Two households, both alike in dignity. Shakespeare is telling us that we will see two sides, yet we should not pick one over the other, as both are equally worthy of our consideration and respect. He is telling us, in this particular play, there is no right or wrong. There is no good verses evil. These are two families that will be torn apart. And as they are alike in dignity they are equally alike in blame. By the end of the play, we realize both deserve our sympathy and scorn. I am awed by these first six words. That it only took six words to tell us so much about the play. Break it down into four and it is even more awe inspiring; both alike in dignity. Shakespeare seems to be reminding us that there is no difference between these two families, and by extension, no difference between families in general. We know this, because this is what the play is about. It is about two normal families who struggle to navigate a world that demands adherence to social norms and traditions, no matter the cost. This was Shakespeare’s world. Class structure may have been a barrier between the wealthy and working class, (illustrated by the wall surrounding the Capulet’s garden) but yet we are asked to observe that each of these two families are alike in dignity. These two families represent traditional families, in the sense that there is nothing special about them. Shakespeare’s audience would have easily recognized themselves mirrored in the Capulets and Montages. Shakespeare wrote these lines to remind his audience that these two families deserve our attention in equal measure; that there is no good guys or bad guys. And in a broader sense, all families are like in dignity. And that what we are about to watch cannot be judged on who is right, and who is wrong. Each deserves equal consideration. What a powerful opening message. Leave it to Shakespeare to master the art of first words. Opening lines invite us to enter into new worlds by enticing us with their beauty. Yet many times they offer us fair warning of what we are about to see. We need to pay attention to the etchings on the gates so that we fully appreciate where we are going and what we are about to see. This is a great article. I’d like to feature it on my blog, A Writer’s Path (about 6,100 followers). I would include credit, a short bio, and a link back to your blog. Feel free to check mine out; I regularly do guest posts from talented bloggers. But before I even considered it, I wanted to ask your permission first. Thank you for the kind words. I have no problem being shared as long as I get some kind of credit. Feel free to share. Previous Previous post: The Decline of American bookstores Who will speak for the books?